The Artists Garden is situated within the original abbey walls at the rear of York Art Gallery. Together with the Edible Wood, it was created to coincide with the gallery’s £8 million development. The site is used to display contemporary art for free. The two acres of land were previously closed off to the public but now link with the original York Museum Gardens and through to Exhibition Square via a new snickleway to the side of the gallery. Museum Garden opening times apply – click here to visit the York Museum Gardens website. Keep visiting this page for news of our next commission! The Pollinarium is a spatial laboratory that creates art installations around the world with an ecological and environmental theme. To find out more, visit The Pollinarium. Foundation Myths was the first installation ever to be commission for the site and officially opened on 18 August 2016. The installation was created by Charles Holland of Ordinary Architecture, an art, architecture and design practice with an international profile. The installation, produced especially for the Artists Garden, drew on the rich history of the site and its many uses over the centuries. To find out more, visit Foundation Myths. Doug Fishbone’s Leisure Land Golf was a fully playable crazy golf course, with each golf hole designed and made by a different artist from the contemporary art world. The gallery successfully raised over £10,000 to loan the installation with an Art Happens campaign (Art Fund’s crowdfunding platform). To find out more, visit Leisure Land Golf. 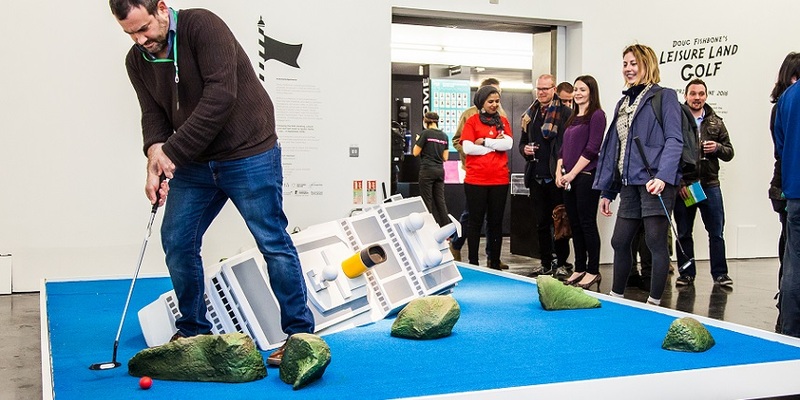 Doug Fishbone’s Leisure Land Golf is a touring exhibition by New Art Exchange (NAE), Nottingham. The Exhibition was originally commissioned by EM15, a collective of arts organisations from the East Midlands, for the #56 Venice Biennale, and is loaned with kind permission by the artist and New Art Exchange, Nottingham. Doug Fishbone, SOS, 2015, installation at New Art Exchange, photo credit Bartosz Kali. Touring exhibition by New Art Exchange (NAE).